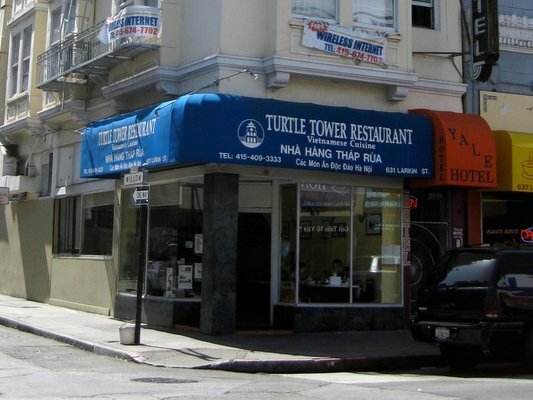 Turtle Tower can be found in the Tenderloin, one of the sketchier parts of town. And that’s saying something. But, although the area that it is located in doesn’t sound appetizing, the phở that it serves is really delicious and of high quality. The phở is northern-style, which is different from what you find at most other phở restaurants, which are typically southern-style and are typically accompanied by side garnishes such as bean sprouts or mint leaves. You won’t find any of that at Turtle Tower. You also won’t find any hoisin sauce and, if you want Sriracha sauce, you’ll have to ask for it. When I went, I ordered #10, the Phở Gà Lòng (Chicken Noodle Soup with Chicken Giblets). At the time, the menu said a large bowl was $7.95, but I was given a dollar off! Maybe that was because I was there early enough to quality for an early-bird discount. Or, more likely, maybe I unknowingly got a #9 instead (which is the same thing except with no giblets and is only $6.95 for a large bowl). As for the food itself, the chicken and broth were tasty but not too salty, the noodles tasted firm and fresh, and everything together left a pleasing, clean, not-too-oily feeling afterward. Turtle Tower’s website says that they buy produce from local farmers’ markets as well as free-range chickens, so maybe that’s why. I was reasonably full after finishing a large bowl but, as always, I’m sure I’ll get hungry soon enough. Not really the fault of the restaurant that noodle soups seem to dissipate quickly after consumption. I hope to be back soon, and will likely try one of their beef phở dishes next time. This place is a good find, and it looks like the other nearby places on Larkin are promising as well. I’ve already tried Lers Ros, a Thai place that is about a block north and across the street. Perhaps I will finally find my go-to bánh mì sandwich place in this area. This entry was posted in Restaurants, Vietnamese and tagged Pho. Bookmark the permalink.